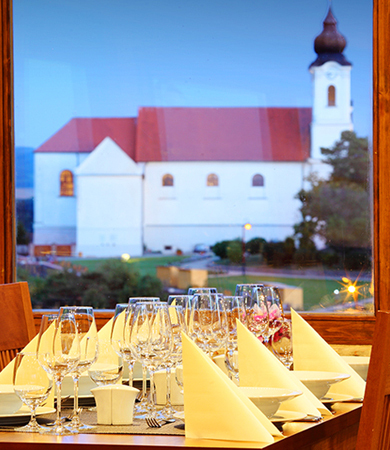 A glass of good wine, selected food and the view of the infinite Balaton, what else could you need? In the Echo Restaurant & Café you can enjoy the best of modern Hungarian and international cuisine and a wonderful panorama at the same time. This is like peace therapy! We believe that gastronomy is all about experiences, so with our professional service and occasional live-music we want to make your conversations with friends or family or other festive occasions something really special. Visit us and enjoy the tranquility, the incomparable views and our hospitality! "The motto of our Chef is: All dishes are freshly prepared and served!" In compiling our menu we do not strive for a wide range of dishes, but for high quality. Our offer combines the traditional Hungarian flavors with the exceptional recipes of international cuisine, our dishes are prepared with modern kitchen technology, equipment and procedures. It is important for us to offer an outstanding dining experience to the friends of the modern Hungarian cuisine - our dishes are always fresh and elegantly presented. In our Café we make your stay with coffee-specialties, homemade syrups and lemonade more enjoyable. If you have a sweet tooth you can choose from a wide range of desserts, which is changed every week; all desserts are prepared using high quality, fresh and seasonal ingredients.